As you explore the verdant landscape of Sri Lanka, where you’ll be surrounded by the Knuckles Mountain Range, and luscious vegetation, book a stay at the traditional Sri Lankan house, Subashri Villa, part of the famous Victoria Golf & Country Club. 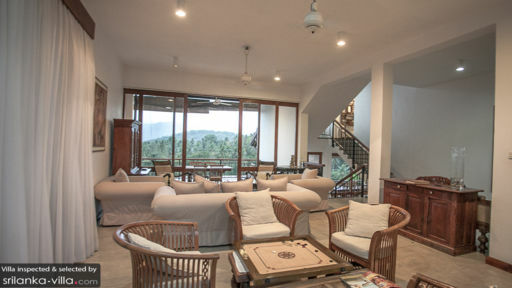 With four or five bedrooms for guests, you can travel with a larger party as well, so that everyone can enjoy the scenic beauty of Sri Lanka’s central province and explore the many trails and hikes around the area. Guests of the villa get access to the golf grounds of the country club for only a Green Fee! 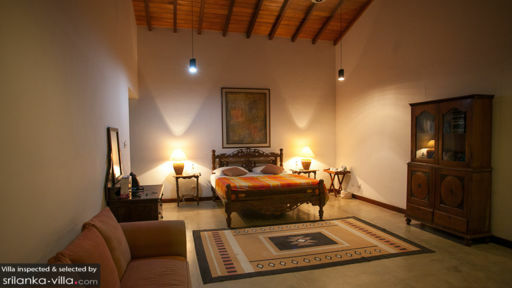 The four bedrooms at Subashri are furnished with antique double beds featuring extra comfortable bedding. There are vintage armoires and sofas in the bedrooms along with a traditional ceiling that only adds to the old-world charm the rooms represent. Each bedroom can accommodate two extra single beds for adults and children alike. There are en-suite bathrooms fitted with necessary amenities for all rooms. If you require, the entertainment area can be converted into a fifth bedroom complete with an en-suite bathroom as it has two sofa beds for guests. 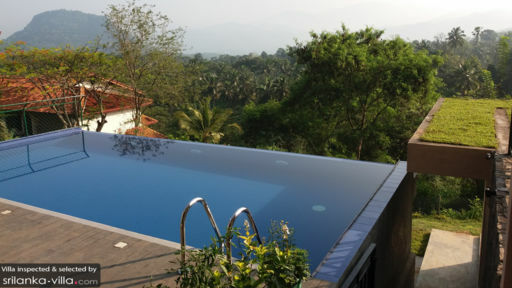 As a guest of Subashri, you have access to its infinity swimming pool that is a coveted seat offering the best view around with the mountain range visible alongside the verdure of Sri Lanka’s tropical foliage. The timber pool deck is a great spot for relaxation, where you can simply sunbathe and rest with a good book while the tropical sun shines down on you. The view is splendidly captured by the architecture of the villa, and no matter where you sit you are bound to be enchanted by it. There are trees towering way above the villa rooftop, dense bushes, and blooming flowers that release their sweet smell into the air for a heady and tranquil experience. For a common space where guests can come together for a relaxing and quiet evening, the living areas at Subashri are quite perfect owing to their charming interiors that are sure to put you at ease. Calming, white tones and plush couches are the key to a comfortable living space and here at Subashri you get just that. Designed with a unique and traditional flair still retaining a European history, the living area is ideal for family and quality time with loved ones. It opens out to a private balcony which again serves as a vantage point with amazing views. A spot of rejuvenation, the living area accommodates a sitting corner with a carom board in the centre, the best way to spend time with friends and family. An entertainment room with a Smart TV and DVD player is furnished with two sofas beds so you can snuggle up for movie nights. The dining area is found out on the balcony for an alfresco experience. A fully-equipped kitchen with modern amenities is also at your disposal. The staff at Subashri and Victoria Golf & Country Resort will look after guests with care offering all the necessary amenities including housekeeping, maintenance, security, etc. What’s more, you can even access the Golf Club with a minimal Green Fee as guests and go horseback riding to traverse the landscape. There is so much to engage in around Subashri including hikes and nature trails to an ancient rock temple in Bumbara Rock and World’s End. Go on a safari in Minneriya & Udawalawe National Park and visit the Buddha Tooth Relic Temple in the historical city of Kandy.